Find out what qualifications are available, and how these fit in the New Zealand Qualifications Framework. You can also learn more about the National Certificate of Educational Achievement, or NCEA, New Zealand's main national qualification for secondary school students. What qualification can I get? How do qualifications relate to NCEA and the New Zealand Qualifications Framework? The level you start at may depend on the study you have completed at school and the entry criteria into different courses, as these vary from qualification to qualification. Look at the job or field of work you are interested in to decide which qualification you will need. The National Certificate of Educational Achievement (NCEA) is part of the New Zealand Qualifications Framework (NZQF). All qualifications approved by New Zealand Qualifications Authority are placed at different levels on the framework depending on how complex the study is. 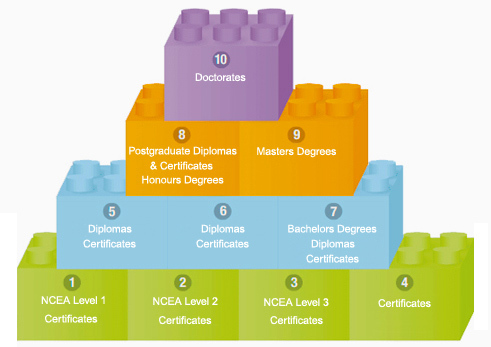 The NZQF has 10 levels, from level 1 certificates to level 10 doctorates. NCEA ranges from level 1 to level 3. You may be able to work on work-related national certificates as well as NCEA while at school. For example, if you are studying materials technology to gain NCEA credits, your class might also work to earn the National Certificate in Elementary Construction Skills. even if you don’t complete a full NCEA at school, you can take the credits you earn for the national certificate (and NCEA) into other workplace training. You can also work on national certificates while you’re at school if you enrol in Gateway or STAR programmes.